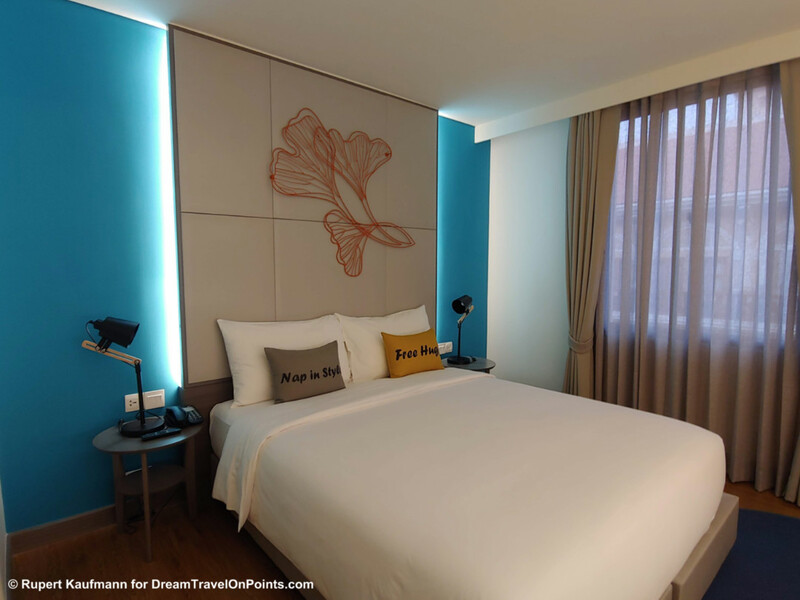 The ibis styles Siem Reap is a brand new hotel in the heart of town. It offers modern, colorful rooms, a nice rooftop pool and friendly service at a bargain rate. You are getting a mid-scale hotel for a budget price, making it very good value. It works best for people who want to explore the ancient temples of Angkor by day and be close to the bars, restaurants and nightlife of Siem Reap, Cambodia, at night! 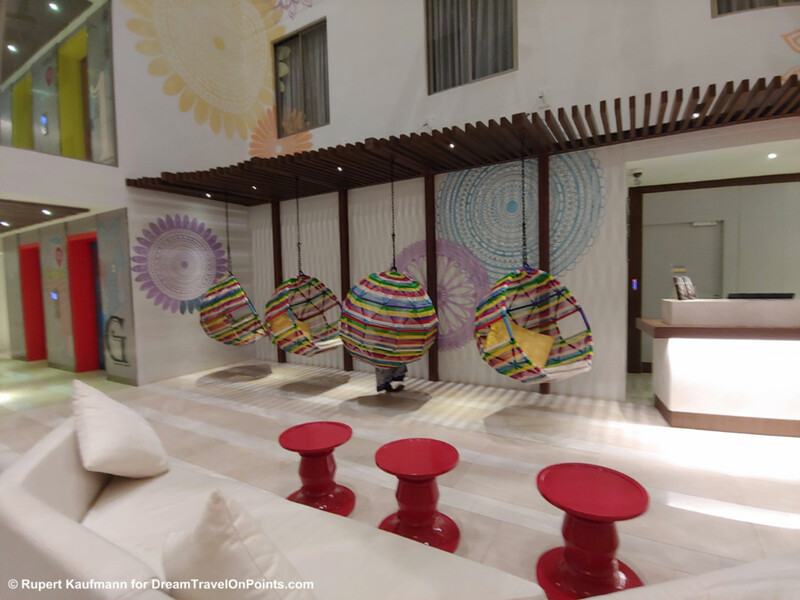 Check out my detailed review and photos of the ibis styles Siem Reap to see what you can expect! Location: The ibis styles Siem Reap is located in the heart of town on the river, just steps away from the night market and pub street. That makes it a great location to explore the bars, restaurants, shops and markets of Siem Reap on foot. It also means that you’ll be exposed to the music and noise of the bars. The ride to the airport is about 30 minutes. 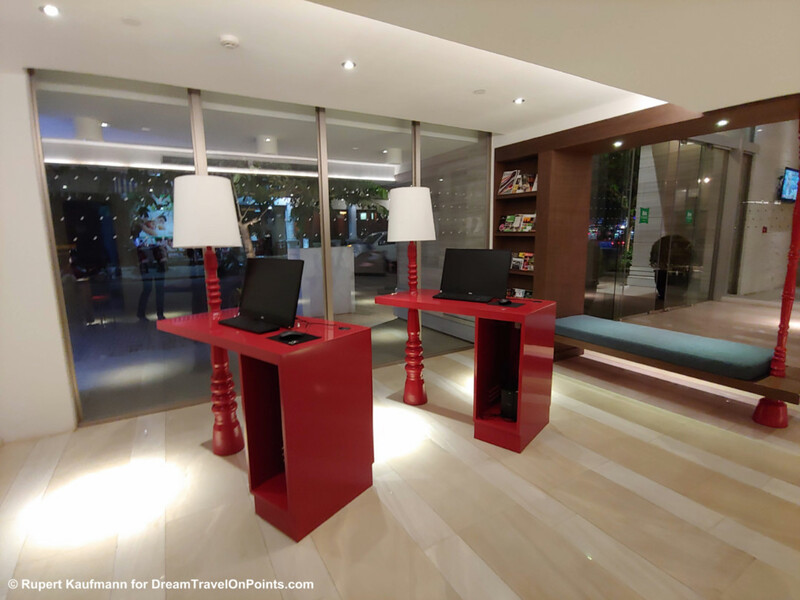 Service: Staff at the ibis styles Siem Reap was exceptionally friendly and professional. The front desk welcomed me warmly without a wait, retrieved my reservation quickly and had me checked in within minutes. They provided me with all the information about the hotel and amenities. I was upgraded from a standard to a superior room. When I inquired about noise, they explained the hotel layout and offered to change to a inward facing, standard room, if I’d prefer. Checkout was equally seamless and quick. Restaurant staff was just as friendly and attentive. Staff took orders for made-to-order eggs and delivered to the table. They also checked for further wishes towards the end of the breakfast time. They cleared tables quickly and the restaurant always looked inviting. They were slow to refill the buffet and items ran out towards the end of the meal, although that seemed to be rather a management decision than lack of attention by the staff. Room: I had booked a Standard Double room and was upgraded to a Superior Double room. 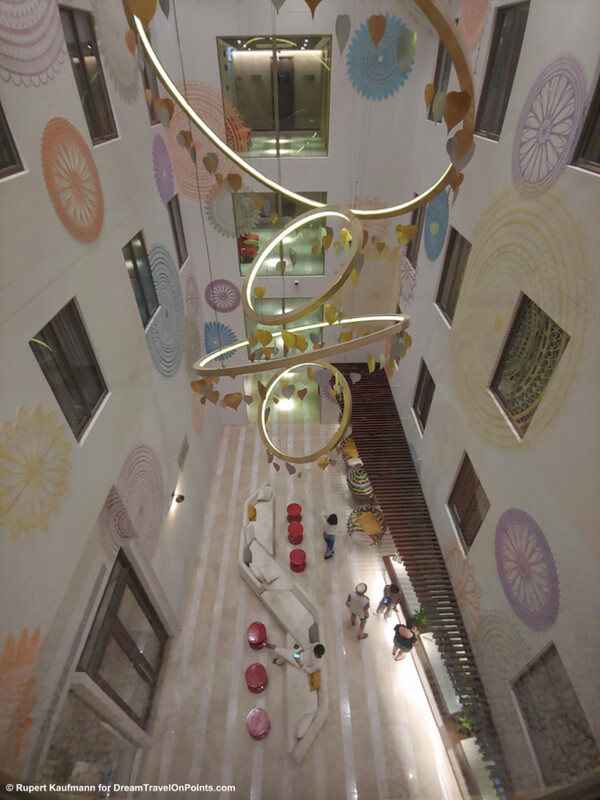 The main difference is that the standard rooms face the interior atrium of the hotel, while the Superior rooms face the streets and have natural sunlight and opening windows. The rooms are otherwise identical, so you decide whether you prefer natural light or a quieter room. The modern rooms have an open layout, white tile floors in the entrance area and bathroom and wood-laminate floors in the bedroom. The glass bathroom enclosure has bright yellow graphics on it and the bedroom has a blue accent wall and a padded, backlit headboard. It’s all very fresh and bright, I like it, but it might be too colorful for some. 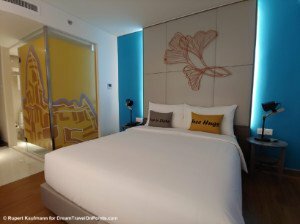 The queen-size bed is very comfortable with surprisingly high-quality sheets, comforter and pillows for this category of hotel – I slept like a baby. There nightstands on each side with a lamp, switches for the main room lights and universal power outlets. Facing the bed are a sideboard with a wall-mounted TV above it, a small desk with chair and an open cabinet with the mini-fridge and coffee/tea facilities. A small wardrobe by the door holds the laptop size safe. The open concept bathroom has a sink in the center and the toilet to one side. The counter offers plenty of space for toiletries. 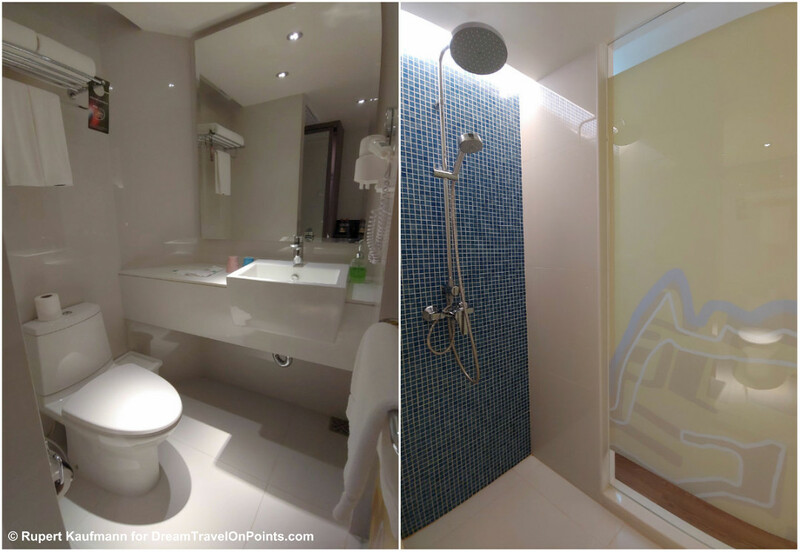 The walk-in shower is on the other side and it has a mounted hand-shower and rainfall shower head, both with enough pressure. The glass door closes the bathroom in one position or the shower in the other, a simple yet effective idea. The graphic film on the shower and door allows some light into the bathroom, but provides full privacy. The provided towels are plush. Soap and shampoo are provided in dispensers, other amenities including dental kits and a hair dryer are also provided. The free WiFi internet was fast, reliable and consistent in the room and public areas with an average speed of 5.9Mbps. It never dropped below 5.86Mbps and upload speeds were even higher, making this great for work as well as streaming video. My room was facing the street with a side-view over the river. I was able to hear music and street noise, but it didn’t have any impact on my sleep. If you are very sensitive to noise, an inward facing standard room might be the better choice. Restaurant & Amenities: The ibis styles Siem Reap has a small pool on the third floor. It offers nice views of the city, river and sunset. There are a handful of loungers near the pool. Towels were provided and there were always some chairs available. 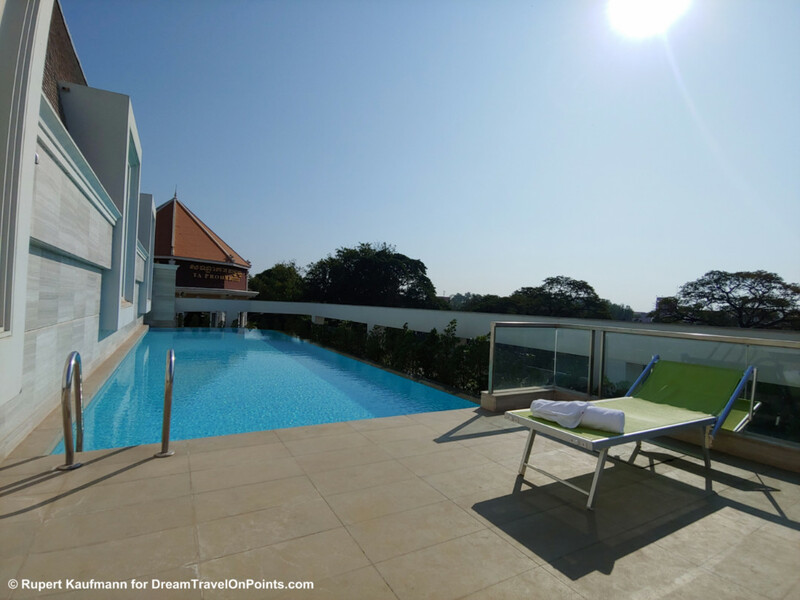 Because it is a fairly narrow space and the loungers are facing a wall rather than the views, it’s not the most inviting space to hang out, but fine to take a cool dip after touring the temples or for kids to play. The hotel doesn’t have a fitness room. In the lobby are two computers, so you’ll have internet access even without your own device. 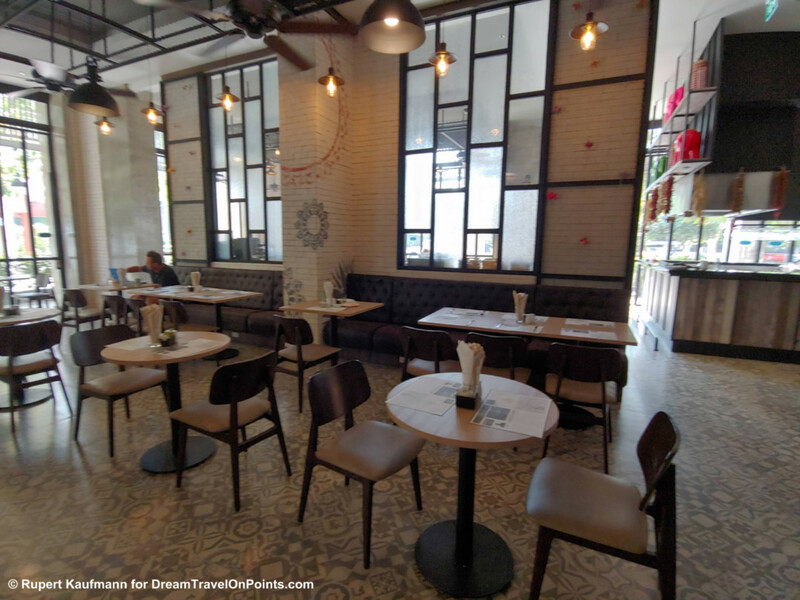 The hotel restaurant “Streats” is on the ground floor and offers indoor and outdoor seating. The outdoor seating has nice river views, indoor seating is air conditioned. The decor is modern, with wood furniture, (fake) brick walls and big graphics for decorations. The seating is bistro style, with chairs and benches. The prices for drinks and food are comparable to independent restaurants in the city center. There is also a coffee shop on the hotel premises. The buffet breakfast is served buffet-style at “Streats”. 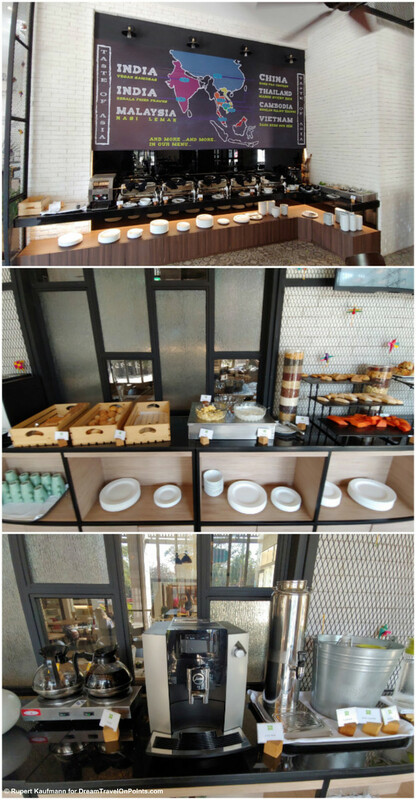 It offers a small selection of fruits, yogurt, bread and pastries, as well as a number of hot, Asian dishes. You can order egg dishes made to your liking. You’ll find a selection of juices, milk and tea as well as very good automated espresso makers. I enjoyed the breakfast for the quality and taste of the food, and I’d consider it above average for the price category, despite the slim selection. The ibis styles Siem Reap does offer an airport pick-up, but it’s not included in the rate as in other properties in this price category. 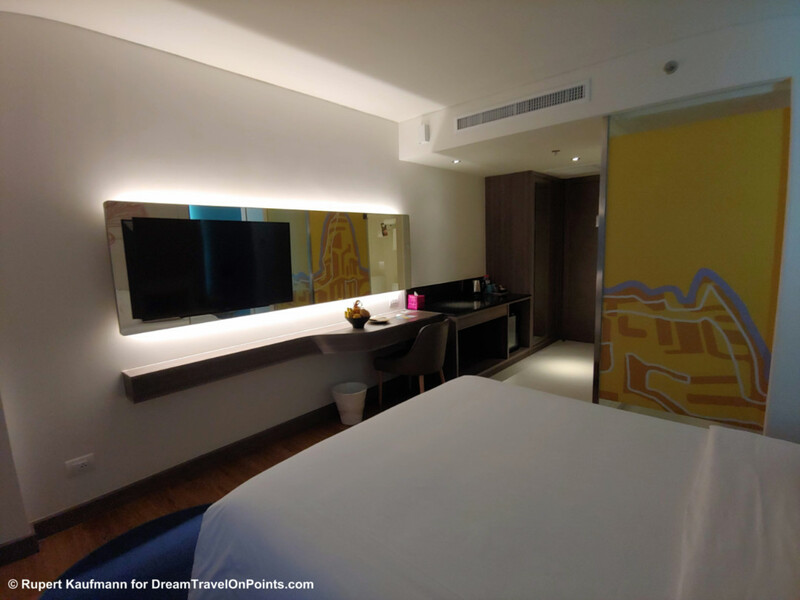 Value & Rewards: I booked the ibis styles Siem Reap through the Accor website, using my AccorPlus member discount for a rate of $35/night including breakfast – that’s exceptional value during high season! I earned Accor LeClub reward points worth $9.40. You can find the best available rates right now here! 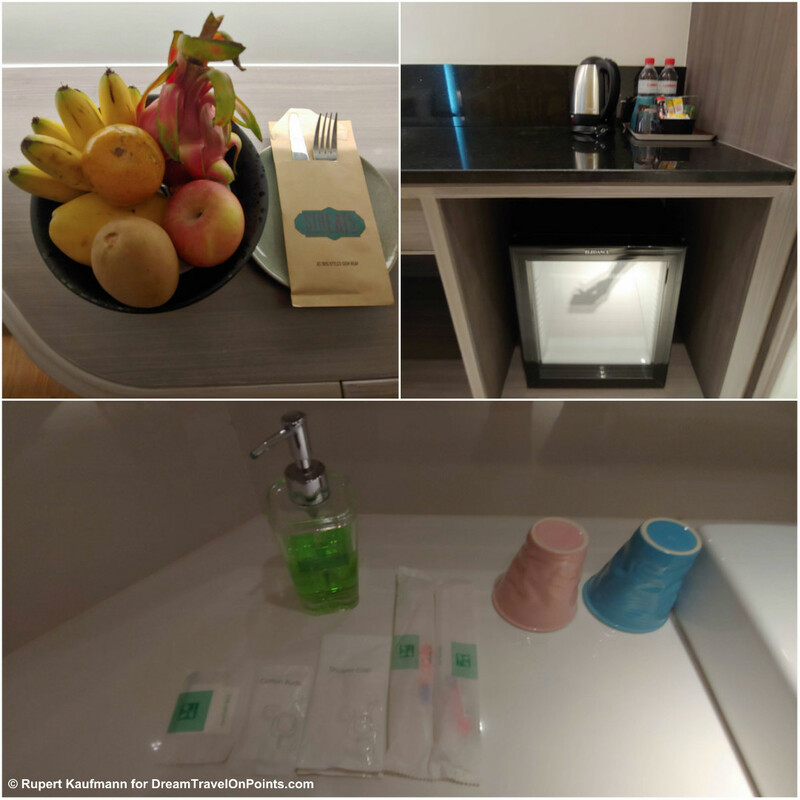 As an Accor LeClub Platinum member, I received a one-category room upgrade, a generous welcome amenity of fruit and a welcome drink at the bar, including anything on the bar menu. While the value of the room upgrade is debatable as you trade sun-light for noise, the promised Platinum benefits were delivered. Bottomline: The ibis styles Siem Reap is a brand new hotel in the heart of town. It offers modern, colorful rooms, a nice rooftop pool and friendly service at a bargain rate. You are getting a mid-scale hotel for a budget price, making it very good value. It works best for people who want to be close to the bars, restaurants and nightlife of Siem Reap. I would happily to return to the ibis styles Siem Reap and recommend you to consider it for your trip to discover Angkor!